Description: Epigenesis, a site integrated artwork was conceived to enhance the quality of life at the new Environmental Health Lab. 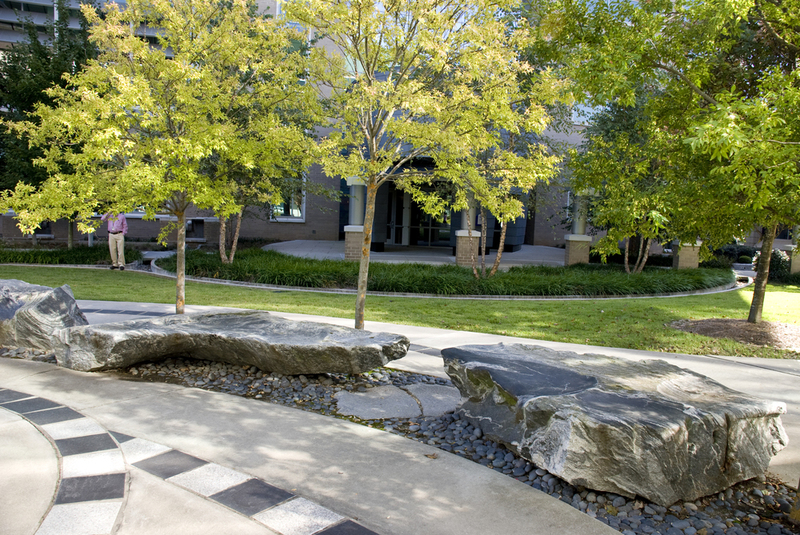 The plaza includes an active water feature and tactile elements in stone, plants and trees providing a relaxing change from the working lab environment. In addition to these physical qualities, the work offers an occasion for reflection and place making, revealing the history and vital activities that continue to flourish at the Environmental Health Lab. It demonstrates the value of the work taking place in the labs with time: past, present and future, serving as an organizing theme. The work is comprised of several elements: five quarry block granite seats, with carved surfaces, A fifty-year time capsule, sandblasted granite pavers showing the past and present work of the lab, a pool with granite standing stone through which water cascades back into the pool, and a one ton cantilevered stone suspended over the water which turns slowly when activated by wind or human interaction.